The heat rays produced by the Astra natural stone heatings "Animal Heating System" are compareable with the warmth of sunrays. During sunshine humans and animals feel comfortably warm even when temperatures are under zero. For which reason? The long waves of the sun rays primarily warm up the bodies on which they meet and only to a small extent the air. The "Animal Heating System" works on the same principle. Continual and monotone heat rays warm up the inhabitants as well as all the objects in the rooms. Virtually the whole room becomes a heater. To meet the temperature-comforts of all the various occupants, the individual temperature preferred can be adjusted to exactly one degree, using a individual room thermostat. As a side effect the search for warmth and the ideal resting place is a good enrichment activity. Therefore the “ Animal Heating System “ is a particularly qualified source of warmth, suitable for all kinds of animals and their various accommodations – wether in the night house, weaning box, aviary or in a larger terrarium. The natural stone heatings have meanwhile also been adopted in visitor rooms, kitchens, social rooms and offices. The “Animal Heating System” is manufactured of natural 20 mm granite. But other kinds of stone, like i.e. marble in various colours are also available for visitor rooms, offices and other special projects. Various form types and extra sizes are also possible of course. The prices stated in our shop are exclusive of the transport costs from the manufacturer in Germany to your destination. Our Animal Heating System is successfully in use in many zoological institutions. Please look at our reference list. Particular advantages of the "Animal Heating System"
therefore no "hot head and cold feet"
For all kind of questions feel welcome to contact us. 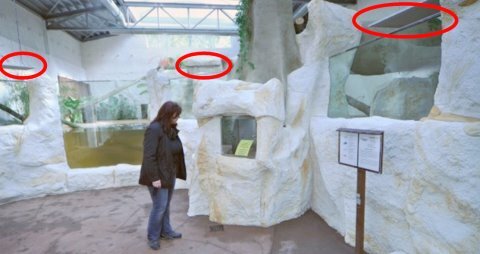 The Vivarium Darmstadt fitted up the crocodile enclosure by mounting multiple AHS heat sources, controlled by timer. So the plates are switched on one after another and warmth moves "from east to west". The idea in the backhead has been to create a kind of "circle of the sun" by continous moving hot spots over the day. By this special installation an increasing activity is created inside of the enclosure. After a short period of time the crocodiles recognized during which time of the day which part of the enclosure contains the hot spot. We are much obliged to Vivarium Darmstadt and Eckhardt Wiesenthal to be part of this wonderful project.